The 16th Annual Engineering Alumni Meet at Amrita started at the Amriteswari Hall with the lighting up of the lamp by Dr. P. Venkat Rangan, Vice Chancellor; Prof. C. Parameswaran, Director, CIR; Dr. Bharat Jayaraman, Chair of PG Programmes; and Dr. M. Elangovan, President of the Alumni Association. In his special address, Dr. Venkat Rangan spoke about the presence of alumni in different parts of the world in prominent positions and their strong emotional bond with Amrita. He suggested that chapters be opened in such places in order to bring them actively into the implementation of alumni programmes and objectives. Eminent alumni could be members of the academic board of studies and they could contribute to the periodic revision of syllabi, he observed. Dr. Venkat Rangan also mentioned about the concept of Live-in-Labs programme introduced recently in pursuance of ambitious service programmes. In the inaugural address Prof. C. Parameswaran, Director Corporate & Industry Relations observed that with the strength of over 14000 alumni and the effective steps to bring more and more of them into a well-knit structure, the alumni association has a great future. 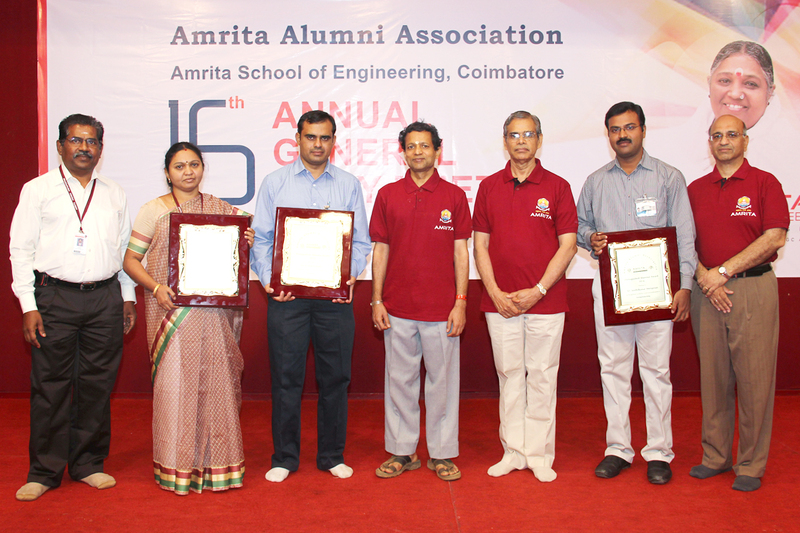 He observed that it is a win-win situation for alumni, Amrita University and the students alike. Speaking about some of the new initiatives, Prof. C. Parameswaran, Director, Corporate & Industry Relations, said, “Apart from the Distinguished Alumni Award, an alumni association ID card, an online alumni directory, a set of re-framed bye-laws and memorabilia are being offered to revitalise the functioning of the association”. The distinguished alumni awards, instituted for the first time ever, were conferred to alumni for their notable contributions to Academics, Industry, Entrepreneurship and Social Service. Dr. K Arul Prakash (Batch 1994-1998), currently the Assistant Professor in the Department of Applied Mechanics, Indian Institute of Technology, Madras, won the Achievement Award for distinguished contribution to Academics. Mr. Senthil Kumar Murugesan (Batch 1998-2002), the Managing Director, Unilogic Technologies Private Limited, won the award for distinguished contribution to Entrepreneurship. Mr. Vijith K.P Nambiar (Batch 1995-1999), presently working as the Director for Middle East operations at Dunbar & Boardman Partnership Ltd., won the award for distinguished contribution to Industry. On his behalf the award was accepted by Dr. Thirumalini, Chairperson of Mechanical Engineering Department.